More than 430 people have now been confirmed dead from last week's devastating earthquake that struck off the Indonesian island of Lombok. The death toll continues to rise as search and rescue crews reach affected villages cut off from the outside world by the disaster, according to a statement issued Monday by Sutopo Purow Nugroho, a spokesman for Indonesia's Natural Disaster Agency. He said efforts to deliver emergency aid to remote villages have been hampered by damaged roads on Lombok. The 6.9-magnitude quake, which struck off the waters of the northern part of Lombok island on August 5, killed 436 people and forced more than 350,000 people to flee their homes. "The damage is and losses are very large," Nugroho said in his statement. He added that economic damage from the earthquake has risen to at least $342 million. 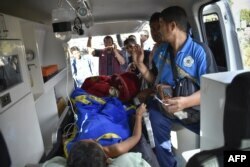 FILE - Members of an Indonesian medical team transport an earthquake survivor in an ambulance in Lombok, July 29, 2018.